2. A book with "Red" or any shade of Red (Scarlet, Crimson, Burgundy, etc) in the title. 8. A book with any other color in the title (Purple, Orange, Silver, Pink, Magenta, etc.). So this is my first time for this challenge. I saw it last year but didn't sign up because the books were still only one color, not shades of. 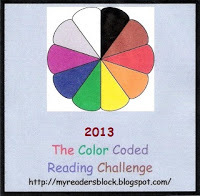 I feel it is a great challenge, but one I couldn't accomplish without the leniency in colors. So here I am reading to tackle it! I'm glad I stretched the categories to include shades. Thanks for joining in!